We dig into the records to reveal the untold story of our village’s most underappreciated genius. The unresolved and perhaps unresolvable mystery of Barrington history is not why Arnett Lines captured local fame. That’s obvious. He was the town’s self-defined historian, public servant, educator, social energizer, and original media influencer in an era before the Internet sired that concept. The town even named an elementary school after him. So the mystery is not his deserved fame in the first 70 years of the 20th Century, but the relative obscurity of his father, Fred Lines, who not only built the 15,000-square-foot Main Street Robertson “White House” by hand—and mostly by himself—he designed and built a half-dozen other grand, unique homes in central Barrington. His hands shaped the village’s architectural heart and soul for a century. Significant? He was a Mozart in towering cherry and oak sculptures. Fred’s handmade, intricate woodwork, sublime furniture, and finial flights of fancy were compelling and precise, all done without electric power tools. He was an artist. 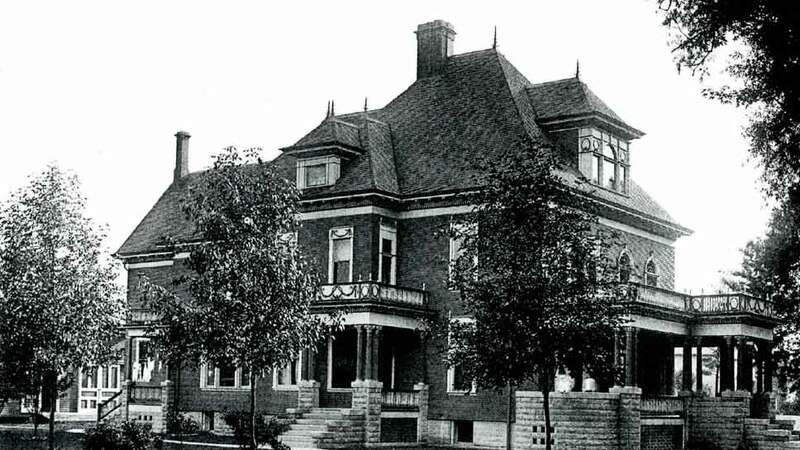 The Lake Street Queen Anne-style house he built singlehandedly for his family 120 years ago still stands downtown. People live there. It is a jewel. Not quite sure who Fred was? That’s not only a shame, it’s the Mystery of the Unappreciated Genius. LEFT: Parents Fred and Emma Lines sit between their sons Arnett (left) and elder son Max. Daughters Viola (left) and Jennie are in back. 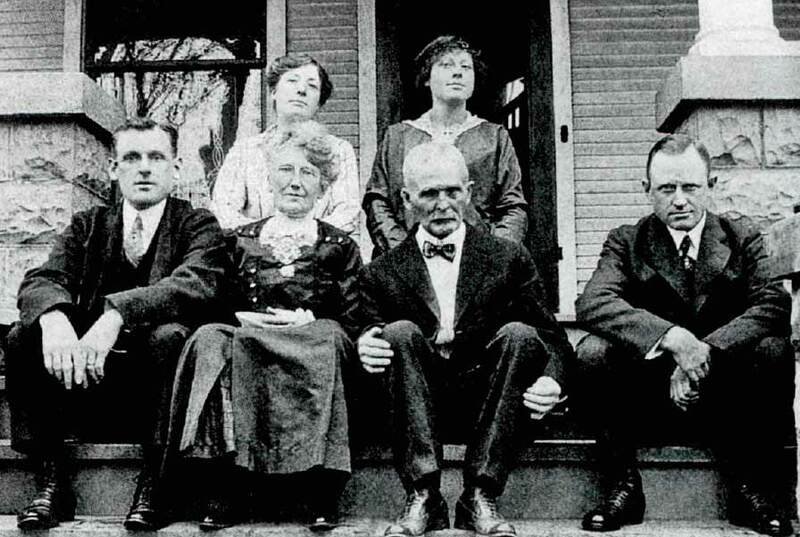 The family is sitting on the porch of Arnett’s Fred-built home at 116 Lake Street in Barrington. Fred and Emma’s home was next door. The photo was taken in 1915, three years before Fred died at age 69. His historian son could have elevated dad to permanent fame. But he didn’t. Why? Impossible to know now. Maybe deliberate snub; or inadvertent lack of artistic appreciation; maybe just father and son differences that went untended. Or maybe he felt a historian’s obligation not to tilt the narrative to favor relatives. But it is strange. Civic sophisticate Arnett shaped the recollection about every Barrington historical character, trend, and event famous locally with his published history, now enshrined in Barrington’s library—everyone but his dad who got barely by-the-way mentions. To hear Arnett report the summits of Fred’s life, he was a carpenter. He was a God-fearing and church-going Christian. He wore bowties. That’s largely all there is. In fact, when his name echoes in print these days, he’s invariably titled with an accurate but subtly dismissive “carpenter Fred Lines.” And yet no one in 1898 Barrington doubted who Fred Lines was. John and Julia Robertson are said to have “built” their now-iconic Classical Revival Foursquare “White House,” but that’s a semantic curtsy to the Robertsons’ social influence. “We want a giant house with a ballroom on the third floor,” Robertson might have told Fred Lines in so many words. So, Fred Lines designed and built the house in one year. All by himself. He knew where every nail was in that house, because he had struck each one into wood. If you never heard of Fred Lines, it’s a loss to historical context, because some small towns never produce a legitimate creative genius of his stature. He was a gentle, rough-hewn artisan, and now, largely is forgotten except by those curious enough to dig deeper. His work was known for 50 miles in all directions, and was held in elevated regard by home builders and wood workers for decades after his passing. They tried to imitate his subtlety, but couldn’t. Why unloved in modern Barrington? The Vault is mum officially, but local observers have theories. Tim Dunn, one of Barrington’s premier keepers of many lore-filled histories, grew up in town with the surviving Lines family, especially Great Aunt Jenny and equally Great Uncle Arnett in the 1960s. When his dad died, Dunn’s guidance through Northwestern University master’s program fell successfully to Arnett who left money to guarantee Dunn’s academic future. Arnett played Santa at Christmas in the Dunn home. “He was a real skinny Santa,” Dunn once said with a laugh. Dunn eventually became chair of Barrington High’s social studies department, history teacher supreme, and a local Hall of Fame wrestling coach. Fred had fallen madly in love with Milius (M.B.) McIntosh’s daughter, Emma, and exited town to seek fame and prosperity elsewhere after they wed.
M.B. was the preeminent Big Man of Barrington. First mayor. Civic driving force and wealthy. M.B.’s wife induced her son-in-law to bring Emma home in 1890 by promising free wood from M.B.’s lumberyard. That raw material became the nearly literal underpinning of Fred’s domestic empire. Even without the thin record of Fred’s work left by his son, Dunn acknowledges the relationship was oddly thin, considering Fred’s unparalleled skill at building residential palaces. The chill did not even thaw when Fred resettled the family back in town in 1890 after moving to downstate Mackinaw where three of their five children were born. He celebrated the homecoming by sculpting a 3,500-square-foot home for them, and another 3,500-square-footer for Arnett next door. By his own hand. “(Aunt) Jenny talked a lot more about her father than Arnett did, and it’s a reasonable question to wonder why Arnett and Fred were not closer,” Dunn acknowledges. Arnett was a teen when dad built the Robertson house, but there’s little hint he helped at all, or even was aware of the colossal project. It seemed to leave no visible impression, though the village was agog. Arnett and M.B. seemed a natural fit, and a son’s admirations that did not accrue easily to Fred shifted seamlessly to a doting grandfather. Arnett’s published history is rich with reverential anecdotes about his grandfather. “It’s certainly a valid question about whether M.B. thought Fred was good enough for his daughter,” Dunn said. Fred and Arnett were fundamentally different, and no outward sign existed that Arnett ever learned how to hammer a nail, nor did Fred ever master conjugating Latin verbs. Sometimes radically different aptitudes produce inadvertent but unbridgeable chasms. While Arnett was an educated, charming civic straw-stirrer, Fred was a gritty, grizzled self-made carpenter who wore black suits and evinced a large mustache. 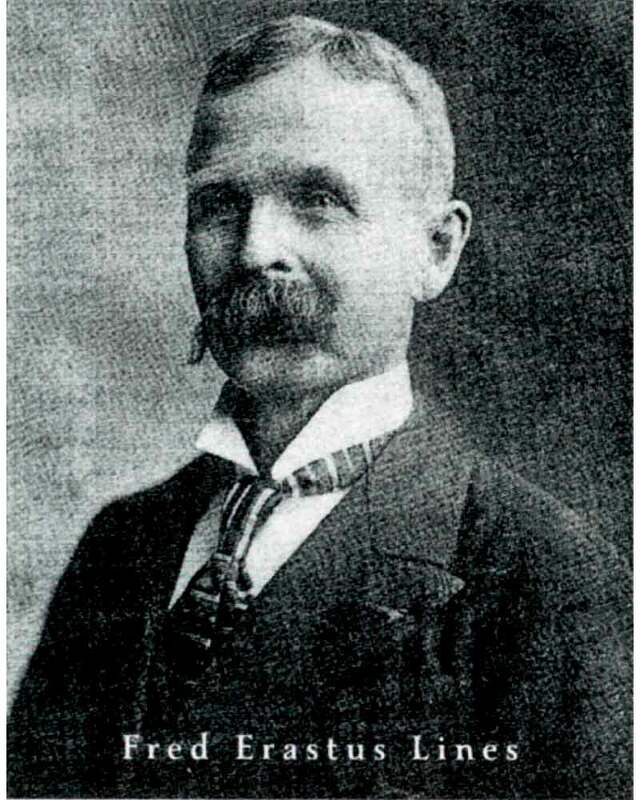 Because Arnett became the de facto arbiter of Barrington’s past, his editorial decisions gave light to some notables, but only dim passing reference to others. Fred Lines was consigned to the dusk. Recorded history—even unintended—can be cruel. As Dunn notes without judgment, there is no way to know what Arnett omitted from his history or why. In all matters, he was a generous man and open hearted. But so was Fred. When the Baptist pastor needed a rectory, Fred built it for him. When St. Anne Catholic Church’s first parish priest asked in 1905 for a rectory, Fred said sure. He built him a prim Victorian-style residence on Franklin Street. It was a pip of a house. Every piece of wood Fred touched became a work of art. As for Fred’s legacy in Arnett’s history, there’s not much to note. And, thus, Fred Lines was consigned (and forever sealed) to history’s vault.